Growing banana peppers is really easy, as they are one of the most forgiving varieties. Still, they do need some care. Let’s take a look at growing banana peppers in the garden. These versatile veggies go by several names, but they can be divided into two main types: sweet banana peppers and hot banana peppers. The most common banana pepper is called Hungarian, and it’s also available both ways. So that’s something to keep in mind when you are perusing the seeds! The hot variety of the banana pepper reaches around 3,500 to 4,000 Scoville Units — about on par with jalapenos. Sure, you can grow these peppers in containers. For a bountiful harvest, I suggest 5-gallon containers. However, with a good potting soil, plenty of fertilizer, water and sunshine, they can also be grown successfully in 3-gallon pots. Here’s more detailed information about container pepper growing. 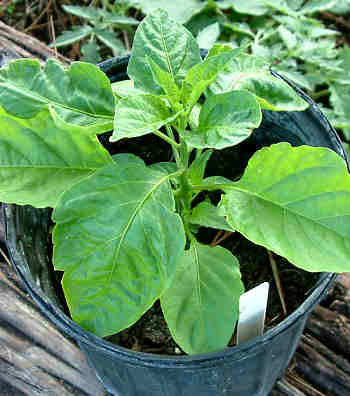 Peppers, including the bananas, have similar requirements to their relative the tomato. That includes a fertilizer that has more phosphorus (the middle number of the fertilizer content) than nitrogen. 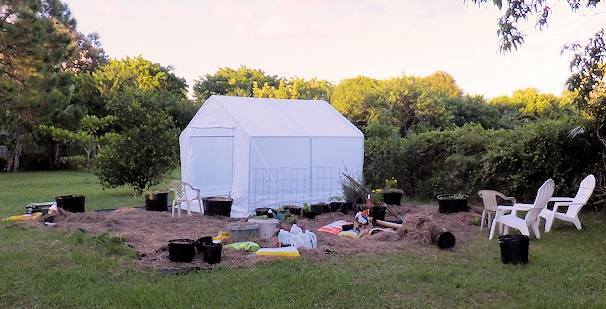 While a lot of nitrogen will grow you large, lush plants, you won’t get many peppers off it. Peppers like rich, well-drained soil. I’ve found that they also appreciate “fluffy” soil, which doesn’t compact easily, but which holds enough water to keep the plant happy. I do this by incorporating compost, sphagnum moss and perlite in the planting hole and surrounding soil. Peppers like warm weather, especially the hot varieties. They don’t appreciate a windy location, so if you do get really breezy on a regular basis, see about constructing a wind break of sorts. You can eat the banana peppers when they are immature (green), ripe (red) or anywhere in between! Here’s a hint: a sweet pepper will grow sweeter the riper it gets. Similarly, a hot banana pepper will turn up the heat, the riper it is. Enjoy growing (and eating) your banana peppers! I’ll probably have to let any other readers jump in on this, if they have experience. Personally, I just cut off a piece of the plant and stick it in moist seed-starting soil in bright shade — not very scientific, but I also rarely do cuttings. Likewise on the grafting — that I have never done, so I can’t advise you. However, if any other readers out there know a good source of information, please pass it along. Meanwhile, all I can suggest is to check out the search engine listing for grafting pepper plants. I’ve had that happen a time or two, and it certainly is frustrating! Here are some of my thoughts. If the seeds and soil aren’t kept warm enough, they may not sprout. Keeping the soil moist isn’t always enough; without being warm enough the seeds just won’t sprout. Warm means between 80 degrees and 90 degrees (fahrenheit). 85 degrees is a good temperature. Some varieties need a long time before they do anything. Although banana peppers in general only need a week or two, I’ve had seeds take 4 weeks before sprouting. If your seeds weren’t dried and stored properly, they may have died. Yes, seeds are alive, just really, really dormant. I like to sprout seeds in a small cup, using sterile potting mix. Here’s a link to the way I plant peppers. In your case, I am guessing that the miracle-gro was the culprit, as it contains extras that are great for plant growth, but not so good for sprouting pepper seeds. I’M GROWING BANNANA PEPPERS AND THEY’VE DONE GREAT SO FAR. I HAVE EVEN PICKED A FEW BUT NOW THEY ARE STARTING TO TURN BROWN ON THE PLANT… PLEASE HELP. That happens sometimes when the plants don’t get enough air circulation, or they are in a spot where the morning dew doesn’t disappear from the plants for quite some time after the sun rises. It can also happen if the plant is stressed for some other reason, like a sudden change in weather (like from going to mild temperatures to really hot within a few days). At this point, all you can really do is pick the peppers as soon as you can, before they turn brown. Or, if they are turning brown when they are very small, pick them off as soon as you see it. Having a lot of fruit at one time is also somewhat stressful for the plant, so it needs plenty of water and light doses of fertilizer every couple of weeks (I like to do it about 1/3 strength). I hope this helps, and that your peppers pull through! I’d say that the 8 inch plants would be OK to leave a few blossoms on, but pinching off the flowers for the 6 inch plants is a good idea. Although banana peppers are pretty prolific, you’ll ultimately get more (and larger) peppers if you let the plants get a little larger before producing fruit. Hello Gail, you say banana peppers can be grown in a hot house? What about a pool lanai? Provided I keep any pool water off the plants. Does the plant need to be pollinated by bees? The screen prevents any bugs from getting to the plants. I live in southwest Florida. Best wishes for lots of peppers! my banana peppers are producing lots of peppers that look and taste great, but brown spots have started appearing on the leaves and leaves are shedding from the plant. some small fruit are falling off as well. What is the problem? I recently bought a hungarian and cayenne pepper pots (there was 4 plants in each pot.) So I decided to divide them up and put them in bigger plants. Since then for the last 10 days the leaves on the plants are very droopy (wilting) I have them in a green house where the temperature is a constant 70-90 degrees. I have kept them fairly moist not dry but not soaking wet. Is there any tips you can give me. I would really apperciate it. Ilove pickle peppers! My sweet banana peppers are growing very well. I have picked some that are about four to five inches long. However, they are very bland and do not taste as I expected. Am I picking them too early? Sweet banana peppers don’t get really sweet until they are ripe — which means that they at least need to be orange — and red is better. When they are green, they are best used in pickles or at least “marinated” a couple of hours in something like a basalmic dressing. Hope this helps! My first thought is that if it’s the last 10 days since you divided them, it’s shock. The roots aren’t able to absorb as much water or nutrients, until the new roots start growing. If they are in direct sun, try giving them a tiny bit of shade while the roots start growing. Then once they stabilize, put them back in direct sun. My first thought is that the plants aren’t getting enough air circulation, to help keep the leaves and the peppers dry (only the roots should be moist/wet). Another thought would be insects; get out a magnifying glass and inspect the plants — early morning and late afternoon are best. Finally, how well are the plants mulched? If the soil has bacteria and the soil gets splashed onto the plants while watering, that could be contributing. A thick layer of mulch helps that. i have banana peppers growing…they are 6 to 8 inches tall….the flowers grow and then the peppers start…they get about 1/4 inch long and then the stem and the pepper that it is attached to falls off….do you know why? I have them growing next to roma and heritage tomato plants. How are your tomatoes doing? The reason I ask is because tomatoes tend to have more problems with bacteria and such, which can be transmitted to the peppers. If the tomatoes are doing fine, then I’d give the peppers some extra phosphorus, plus some calcium. Both promote fruiting. Also, if you can find some kelp spray, spray the leaves and fruit every day or so. Early morning is best. Kelp is non-toxic (it’s a form of seaweed), so there’s no harm in it when you eat the peppers. A critter is eating my banana peppers all of a sudden. It’s poop is many small round black balls. All different size poop and it poops a lot (about 1/4 inch round). It only is interested in my sweet banana peppers, no other peppers, tomatoes or anything else. It must be a rather small animal because it seems to have a small bite. Never eats the whole pepper. Does anyone have a clue what it could be? Or how I can prevent it from chewing on them? Thanks for any help on this subject. I would say rabbits (my nemesis), but rabbits would be eating more than just banana peppers. Well, that’s what they do to me, at any rate, LOL. I’ll have to open this up for others, because I can’t think of anything that I normally run across that fits your description. You may have to try and hang out near the peppers at dawn or dusk, which is when most animals are nibbling.